Doug once wrote (in an article which is not currently online, but that is another issue for another day), that it’s hard enough to orient yourself in what someone else has written but even harder with ones own work. I believe he was (at least partly) referring to the process of writing something and then kind of remembering that you have written something about the specific topic before and wanting to somehow insert it into the new text but having a hard time finding it. For this reason I came up with this functionality for Liquid | Author: When authoring and one has a valid URL on the clipboard then cmd-k on selected text simply adds the link, as is common on the Mac. However, if there is no valid URL then Author will produce a dialog like this, with the assumption that the author wants to link to their previous work. In this case the further assumption, or use-case, is that the author publishes into WordPress, though of course the concept is extensible. The goal is to help the author find the previous article within 2 seconds of looking for it and to insert it or examine it further with single-click instantaneousness. In the mockup below, the author can refine the list of blog posts (central column) based on what Categories are active (left column), what tags are active (right column) and, optionally (as are all the criteria here), keyword search and constricting the list to showing only long (likely important or at least meaningful statements), short or ‘either’ long or short post length. The author can click on a blog post to expand to see some of the initial text, double-click to make a citation (Copy As Citation in the Chris Gutteridge Style) or long-click to choose to open it in a browser. 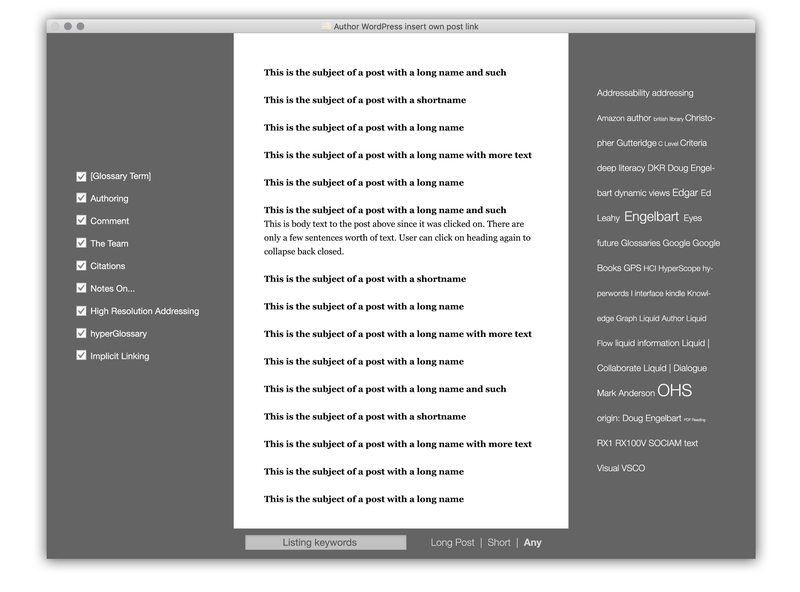 If all this is built inside Author/word processor: Once the user chooses a post and double-clicks to make it a link, the dialog disappears and the selected text has a dagger† or a link (user pref, maybe on this screen), and they can keep writing, knowing that they won’t have to repeat themselves. If this happens in WordPress: The user can copy the citation and paste it in to any word processor. I think this can be significantly useful and I am looking into how to get this built.